Don’t miss out on these WordPress deals your website will LOVE!! Last day to save BIG! Just like buying a house, your website needs maintenance. You need a good foundation and you want to protect your investment. You don’t want all that hard work bogged down by slow servers or worse hijacked by a hacker bots. Good hosting and regular maintenance is a must and we’re delivering some awesome Cyber Monday WordPress Deals to make sure your website runs smooth and stays secure and up to date. Once you have your website built on the best platform out there and it’s supported by a reliable host, you MUST maintain your site. Did you know that over870% of WordPress installs are vulnerable to attackers and there are tools readily available to them to scan for those sites at risk? WordPress, Themes & Plugins are always being recoded to bring you a more secure experience, but you have to run these updates regularly. If you let your platform run unattended it may become compromised and taken over by hackers – who wants that? No one does! Ask anyone that has had to start from scratch due to a compromised plugin they didn’t update. 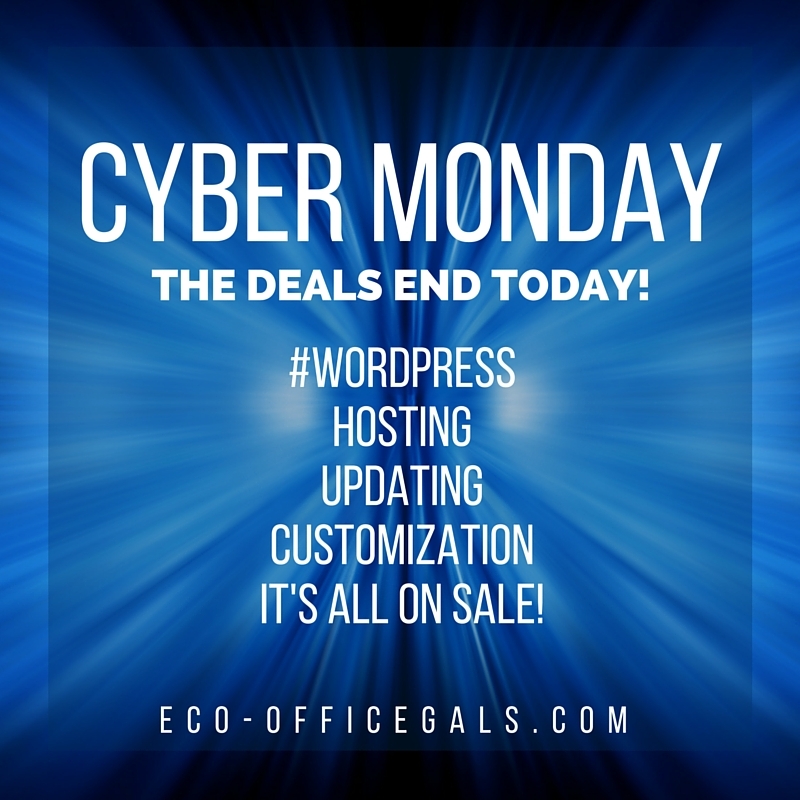 Eco-Office Gals is offering up to 50% OFF* on our Monthly WordPress Maintenance package through Monday. Not only will you get a discount on 1 site (regularly $60 per site), but you will receive additional multi-site discounts! Your maintenance includes regular updates of all existing WordPress, Theme & Plugins PLUS a weekly restore point! Please review all details and fine print on our Monthly Maintenance Page, but come back here to sign up for the reduced rate. Once you are signed up I will contact you for information needed to update your websites. If you are currently experiencing issued with your WordPress site or you are several versions behind please contact us directly to assess your needs before paying for this service. Want and even better deal? Purchase annual maintenance and receive another 10% OFF these already LOW PRICES! The best part? No lines – you don’t even leave your chair! Make sure you grab these deals your website will thank you! WAIT – You say you don’t have a website?? Contact us and mention this post to receive 20% off your WordPress design estimate! *Up to 50% off applies to multi-site discounts. ** Discounts offered to new customers only.